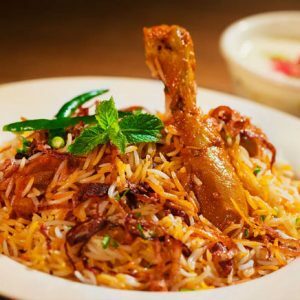 A delicious Nawabi style Mutton Biryani. Best served with raita. 1. Take 2 1/2 tbsp of ghee. Put some salt in it and fry the dry fruits and apricots. Make a fine paste by grinding red chillies and fried onion. 2. 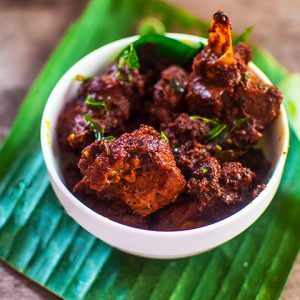 Make a mixture of curd, ginger-garlic paste, onion-chilli paste, turmeric powder and salt and marinate the mutton pieces in it. Put some ghee in a pressure cooker and heat it, and then add the marinated mutton into it. Pressure cook it until done. 3. Put some ghee in another vessel and heat it. Add to this the whole spices and fry them for a while. Now add the rice. Add some salt and warm water. Cook the rice till all the water has been absorbed. 4. Once the rice is cooked, spread it out and let it cool. Also, remove the whole spices that were added to it. Grease the inner wall of a heavy bottomed pan with ghee. Put the cooked mutton into it and sprinkle some garam masala powder. 5. Follow this with a layer of rice, then melted ghee and then saffron milk. Add to this the fried nuts and cover it with a tight fitting lid. For the next 15 to 20 minutes, keep it on dum on low flame. 6. Mix it well and serve hot. Garnish the dish with chopped coriander and mint leaves. 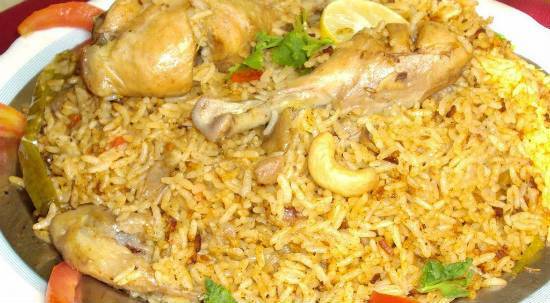 Feel free to comment or share your thoughts on this Nawabi Mutton Biryani Recipe from Awesome Cuisine.